A wine chiller is one of those essential accessories all wine enthusiasts should have. Invented to keep wine at serving temperature at the table, wine chillers are often confounded with wine coolers. Yet, they are two separate objects with distinct features and characteristics. Keep reading if you want to find out more about them or click on the links in the table below to check some of the best wine chillers on the market. VINENCO 3-in-1 Stainless Steel Bottle Cooler Stick, Aerator..
As a wine lover and expert, I hate it when people believe that wine coolers and wine chillers are the same thing. Although their name might sound similar, these two articles are completely different. And that’s not it. Because they are two different objects, chances are you might need to invest in both of them. So, let’s find out which are the fundamental differences between wine chillers and wine coolers, which types of wine chillers there are and how to choose the best one for you. Wine chiller is a name given to a broad range of products designed to keep wine at serving temperature while consuming it. They can be wine buckets, wine chiller wands, and even small appliances build specifically to keep cool an open bottle of wine. On the other hand, wine cooler refers to small appliances similar to refrigerators designed to preserve wines at a constant temperature. Although wine coolers can chill a wine before serving, their purpose is that of replacing the cellar. We have talked about wine coolers before, presenting their types, features, and even brands. However, since the world of wine chillers is so diverse, this article is dedicated exclusively to them. There are three types of wine chillers. Wine buckets, wine wands, and electric wine chillers. They all serve the same purpose and choosing one type over another is often dictated by personal preference. While I like wine buckets, you might feel that the right one for you is a wand or an electric chiller. Like their name suggests, wine buckets are exactly this, buckets. The simplest models are made of stainless steel or even plastic and are really easy to use. These simple models will not chill the wine on their own but can hold a decent amount of ice that will chill the wine and keep it at serving temperature. There are even wine buckets designed to chill the wine and keep it cool without ice. They are made either of stainless steel or marble. Marble models should be kept in the freezer or fridge for at least a few hours before use. This material is able to maintain its low temperature for a long time, chilling your wine and keeping it cool during dinner. Stainless steel models are similar to the thermos flasks. They have double walls and, once chilled, they prevent heat transfer between their content and the environment. This means that you’ll not have to use ice or cold water to chill the wine and keep it fresh. Wine wands are simple accessories made of glass or stainless steel and compatible with a wine pourer and wine stopper. They chill wine by heat transfer and are easy to use. Simply chill the wand in the fridge or freezer for a few hours, then insert it in the open bottle. The cold wand will chill the wine. The main advantage of this chilling system is the simplicity. The wand takes zero space on the table and is easy to use. On the downside, the wand won’t stay cool for a long time. Moreover, if the wine is warm, the wand might not be effective. Electric wine chillers are small appliances designed to chill wine or other beverages before serving. They are not designed to preserve wine and most of them only have a one-bottle capacity. These appliances use different chilling methods but the most popular are those chilling with water. These wine chillers spray ice-cold water on the bottle while spinning it. 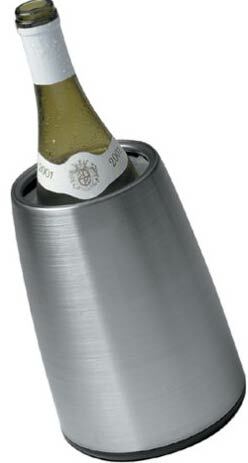 This ensures a fast drop in the wine’s temperature, making it perfect to serve. Needs. If you want to chill an open bottle, a wine bucket might be the best option. A wine wand can also work great, especially if the environmental temperature is not too high. Electric wine chillers are more appropriate if you want to rapidly chill an unopened bottle. Budget. Because there are great differences between the types of wine chillers, they also come at different costs. When choosing the right one for you decide upon a budget and stick to it. Finding the right wine chiller that complies with your budget shouldn’t be hard. Preference. Before buying a wine chiller you should also decide which type you’d like. Sommeliers use traditional wine buckets, but a double-walled wine chiller might be easier to use at home. A wand might be a better option if space is an issue. And an electric wine chiller might be more fun to use at parties. 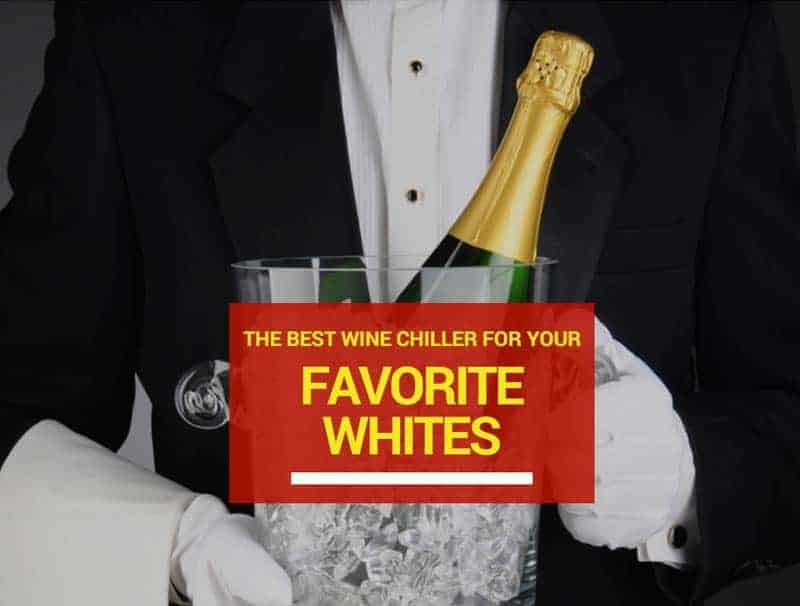 To help you choose the perfect wine chiller for your whites, here’s a selection of the best on the market. This set of electric wine opener and wine chiller makes a great gift for a wine lover and it might be perfect for you. Convenient and boasting two essential wine accessories, this set promises a long time of hassle-free wine opening and serving. Oster is a brand renowned for their high-quality kitchen appliances and accessories. In the world of wine, the manufacturer produces an array of wine coolers and wine accessories which include a high-quality thermal stainless steel wine chiller. The chiller boasts double walls and is designed to chill your beverage without ice or cold water. Thanks to this feature, you can forget about messy wine-serving and enjoy the full aroma and flavors of a white wine chilled to perfection. The opener, on the other hand, comes with a rechargeable base and opens up to 30 bottles on a single charge. The opener also acts as a foil cutter, is easy to use and durable in time. Set: ideal for inexpert wine lovers or as a gift, this set includes a high-quality wine chiller and a cordless electric wine opener. Easy to use: the wine chiller is made of stainless steel and it has double walls designed to cool the wine and keep it at serving temperature for hours. Stylish: the set as a whole has a sleek design while the wine chiller is elegant and stylish. Ideal to use for romantic dinners or wine parties with your friends. Packaging: this set is shipped in a certified frustration-free packaging. This guarantees that your items will arrive in the best conditions. The bottle opener might lose its charge quicker than stated. Cooper Cooler Rapid Beverage & Wine Chiller is an awesome tiny appliance to have if you’re aiming to chill a wine right before opening it. This wine chiller is able to cool down your wine bottle in less than 10 minutes and it even works with beer or soda cans. The Cooper Cooler uses a revolutionary system to chill down your beverage before serving and it boasts an easy operation. The appliance uses ice and cold water to spray the bottles with a gelid stream. The patented process chills by rotating the beverages and spraying them simultaneously, for a quick and hassle-free chilling. The appliance can chill down a wine bottle from 77 to 43°F in only 6 minutes. If your white requires a lower serving temperature, or if you want to chill down soda or beer, Cooper Cooler boasts an “extra chill” setting which chills beverages to 34°F. 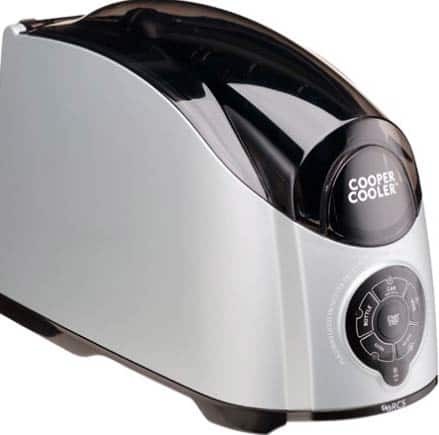 The Cooper Chiller is great for many purposes and it can even be used to heat up baby bottles or hot drinks. Applications: the Cooper Cooler is ideal to chill down wines and other beverages, including carbonated beverages. Fast chilling: this appliance is designed to cool a wine bottle in only 6 minutes while it takes about a minute to chill cans. Removable lid: the wine chiller can even fit non-standard bottles thanks to the removable lid. Options: although chilling by spinning the bottles, the appliance is easy to set to chill without spinning and to turn off when done. You’ll have to constantly fill the unit with ice. A classic wine chiller is preferred by many wine lovers and connoisseurs. 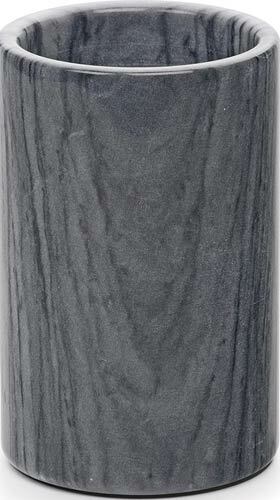 And one to consider is the RSVP Grey Marble Wine Cooler. This wine chiller takes the wine bucket concept to the next level thanks to the unusual choice of material and elegant design. The chiller is made of grey marble and it is quite versatile. You can use it as a wine chiller or as a stylish vase. It even looks good on the countertop holding kitchen accessories. This elegant wine chiller matches with all types of interiors and is easy to use. To chill the wine, place the cooler in the refrigerator or freezer for a few hours, then place the bottle inside. It is recommended to use it with an already chilled bottle, yet it can keep the beverage cold for at least a couple of hours. The marble chiller is 7 inches tall and has a diameter of 4.5 inches. It can accommodate most types of wine and champagne bottles. Design: simple yet stylish, this marble wine chiller matches with all types of interiors and is considered a unique piece of design. Versatility: this chiller doubles as a design vase or stylish kitchen utensils holder. Regardless of the use, it certainly is a versatile item to have. Material: marble is an unusual material to use for a wine chiller. Therefore, this chiller can make a statement about your originality. Size: the chiller can easily accommodate larger wine bottles, such as bottles of prosecco or champagne. The wine chiller is heavy and can easily scratch delicate surfaces. An alternative bucket wine chiller is Vacu Vin Prestige Stainless-Steel Tabletop Wine Cooler. Elegant, stylish and perfect as a gift, this wine chiller is made of stainless steel and is designed to chill your favorite white in less than 10 minutes. The wine chiller is an attractive tabletop wine accessory and it comes with a Rapid Ice cooling element that chills a wine fast and keeps it cold for up to 4 hours. All without the use of ice or water and without making any mess. The Rapid Ice element is, in fact, a pouch containing a gel that, once frozen, is able to chill a bottle in a record time. For it to work, it is recommended to hold the pouch in the freezer for at least a few hours before using it. Without the pouch, the wine chiller will still keep an already chilled wine cool for a few hours. Construction: the Vacu Vin wine chiller is made of stainless steel and is designed to chill the wine without ice or water, minimizing the mess. Rapid Ice element: this gel pouch is designed to chill a warm beverage in less than 10 minutes and to keep it cool for up to 4 hours. Size: able to accommodate even the larger wine bottles, this wine chiller is ideal for almost all wine lovers. Great gift: the Vacu Vin Prestige makes a wonderful gift for a wine lover. It is stylish, easy to use, and versatile. The chiller can accommodate only 750ml bottles. VINENCO 3-in-1 Stainless Steel Bottle Cooler Stick, Aerator & Pourer is an excellent chiller wand designed for those who need to keep a pre-chilled bottle at serving temperature for a few hours. The wand is made of stainless steel and works with almost all types of bottles. The wand chills the wine from the inside while a drip-free pourer and aerator ensure a steady stream of wine without drips. Thanks to this design, you’ll be able to serve your wine like a pro and keep the beverage cool for quite some time. Packed in a sleek black box, the wand also comes with a set of accessories that makes it ideal as a gift. In detail, the wine chiller comes with a foil cutter and wine stopper, a storage pouch and a wine tasting eBook. The chiller is also easy to use. Just put the wand in the freezer for at least one hour, to let the cooling gel is frozen. Pour some wine out of the bottle, insert the wine chiller and enjoy your perfectly chilled white wine for up to 2 hours. Easy to use: this wine chiller is easy to use and it only requires you to allow the cooling gel to froze before using it. Safe: the wand is made of food-grade stainless steel and engineered to maintain the wine’s aroma and flavor. Accessories: this wine chiller doubles as a pourer and aerator. It also comes with a wine stopper, foil cutter, storage pouch and an eBook. Guarantee: the product comes with a 100% money back guarantee which lasts indefinitely. If you’re not satisfied, return the product and ask for a full refund. This wine chiller will not cool down a white wine from room temperature to serving temperature. 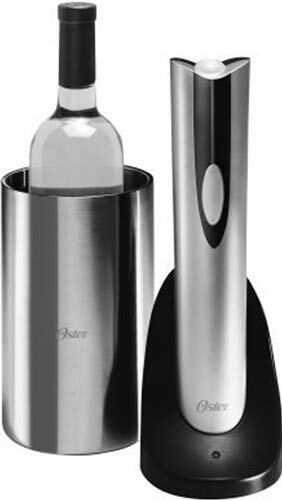 In my opinion, the Oster Rechargeable and Cordless Wine Opener with Chiller is best on the market. The wine chiller included in this set is traditional but has a stylish design. Perfect to chill wines without the use of ice or cold water, this wine chiller can also be used as a traditional wine bucket if needed. The set also includes a convenient electric wine opener and foil cutter, which opens your bottles in a breeze. The opener is easy to operate and comes with its own rechargeable base. Without a doubt, this wine chiller and bottle opener combo make a great gift for yourself or a wine lover.